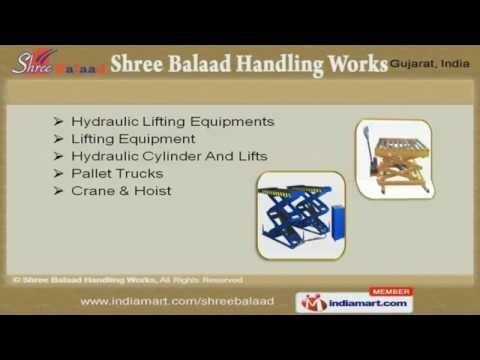 Welcome to Shree Balaad Handling Works Manufacturer & Exporter of Material Handling Equipment & Spares. The company was incepted in 2005 at Ahmedabad. East Asia & Middle East are few of our major markets and we cater to Pharmaceutical, Chemical, Textile & other industries. Hindalco Industries & Elecon Engineering are some of our esteemed clients and we are backed with Cost-efficient machinery, stringent quality inspections & Specialized R& D units. We offer a diverse range of Drum Loader, Platform Trucks, Hydraulic Stackers & Material Handling Cranes. Lifting Equipment, Pallet Trucks, Hydraulic Cylinder and Lifts are also offered by us. We offer Beam Trolley, Industrial Wheels & Pallet Trucks are that are a class apart. Industrial Cranes, Hoist & Castor offered by us are extremely reliable. We also provide Aluminium Ladder, Goods Lifts & Hydraulic Cylinder Body Hydraulic Systems that are best in the industry. Along with that we offer Industrial Conveyor, Aluminium Ladders & Hydraulic Stacker that are of unmatched quality.